Destiny's not great about explaining all of the nooks and crannies and ways of getting more exotic weapons, but that's ok because we have the Internet and the power of crowdsourcing. So here's your latest tip. Xûr can be found in the Tower, but only on the weekends (Friday-Sunday) and he's got quite the stock of goods. If you've been playing through the weekly challenges, you might have noticed that you've been earning some Strange Coins. (Public events, engrams, chests, and crucible rewards can all all drop Strange Coins but it's at random. Weekly challenges are your best bet.) 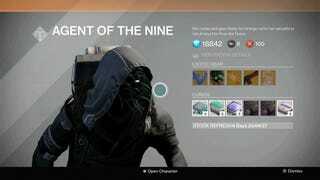 Xûr is who you go to with said coins, which can be turned in for some pretty fancy gear and upgrades. Check out some of his selection from CrossCoastGaming's video above, which he also posted to Reddit. And now you know what your weekend plans are.